Senior Krittika D’Silva, a bioengineering and computer engineering double major, has received a Gates Cambridge Scholarship for postgraduate study at the University of Cambridge in the UK. The scholarship was established in October 2000 with a $210 million donation from the Bill and Melinda Gates Foundation to the University of Cambridge. The program’s objective is to build a network of future leaders committed to improving the lives of others. Cambridge Gates Scholars demonstrate outstanding intellectual ability, leadership potential and strong academic qualifications. At the University of Cambridge, Krittika will pursue a Ph.D. in computer science. She plans to work with Professor Cecilia Mascolo on improving ways mobile technology can be used in developing countries. “Hardware and software paradigms often presume a highly connected Western environment,” Krittika says. However, smartphone use is growing the fastest in developing regions where people often lack stable access to cellular networks. In these areas, apps that require a data connection cannot be used to their full potential. Resources that allow software engineers to build useful software for disconnected environments are lacking. “Traditional best practices for mobile developers do not apply,” she explains. Krittika aims to address this disparity by creating frameworks to simplify offline mobile application development. She hopes that this work will enable more developers to add disconnected capabilities to their mobile applications. 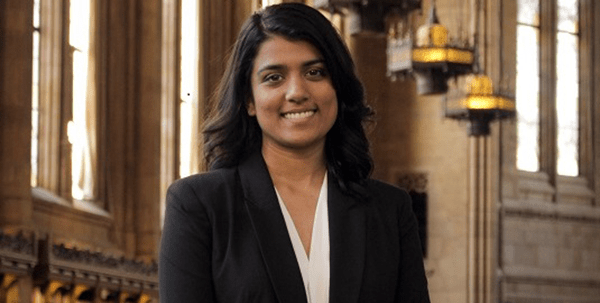 During her time at UW, Krittika’s research has focused on applying bioengineering and software engineering to address challenges in health care. As a freshman, she began working with BioE Professor Joan Sanders to study the physiological and biomechanical issues experienced by lower-limb amputees that impact their quality of life. During her two and a half years in the lab, she worked on several projects investigating ways to improve prosthetic limb socket fit and comfort. She also co-authored research papers and presented the lab’s work at conferences around the nation. While researching in the Sanders lab, Krittika discovered that she enjoyed software development, and decided to pursue a double major in computer engineering. In her third year, she joined the Information and Communication Technologies for Development lab in the UW Department of Computer Science and Engineering. There, she worked with the late CSE Professor Gaetano Borriello, and contributed to a collaborative project between CSE and BioE Professor Paul Yager’s lab. Krittika developed HandWave, an Android library that provides software developers with access to touch-free gestures that can be detected by smartphone front facing cameras. This project addressed the increasing prevalence of smartphones in health care settings, and need for ways workers to interact with mobile devices while handling potentially infectious biologic materials. In 2015, Krittika presented her work on HandWave at the HotMobile computer science conference in Santa Fe, N.M.
With the Yager lab, Krittika built an Android application to enable analysis of paper-based diagnostics with a smartphone in low resource environments. Instead of traveling to a doctor’s office, a patient could use the app take a picture of a paper test strip. The app would analyze and interpret the test, and send the results to a health care provider. The app automates diagnosis of infectious disease at the point of care, enabling faster, more accurate treatment and helping limit spread of disease. Krittika currently works with CSE Associate Professor Luis Ceze to explore ways to use DNA molecules for long-term data storage. The lab is working on methods to reduce the amount of space needed to store digital data such as photos, videos and other electronic media. Krittika’s project focuses on automating a DNA sequencer protocol, and she is creating a machine-learning model to analyze patterns in sequencing errors. In 2014, Krittika was selected as one of five interns from around the world to participate in a project with Microsoft Research in Bangalore, India. The team worked with CGNet Swarma, a voice-based citizen journalism platform, to develop an Android application that enables people in remote areas to share critical information affecting their communities. The app offers users with a simple way to capture audio and video reports of events when and where they happen. Krittika conducted pilot testing with users, many of whom had never used smartphones before, and collected usability feedback to inform future app design. National Geographic reported on the team’s work in September 2014. In 2015, Krittika was selected for a Google software engineering internship. At Google’s headquarters in Mountain View, Calif., she worked with a team responsible for products including Google Hangouts, Plus and Photos. The team worked on a reusable framework for Google products. She helped the team create a library of Android animations, and build a library that provides developers an easy way to integrate the animations into their applications. Outside of research, Krittika enjoys participating in leadership and educational outreach activities. She is vice chair of the Association for Computing Machinery for Women (ACM-W), an organization that supports, celebrates and advocates for women in computing. In this role, she coordinates academic and social events that help creates a supportive community for women students and faculty in CSE at UW and beyond. She also organizes STEM outreach activities and mentorship programs for high school students. After completing her Ph.D. studies, Krittika intends to pursue a career as an academic researcher. Her undergraduate research experience has provided her with a first-hand perspective of how technology can empower individuals in developing countries. She hopes to lead a research lab with a similar focus one day. “Attending graduate school will allow me to grow as a researcher while continuing to build impactful software solutions,” she says.